Native to arid parts of North America. Many branched cylindrical stems that are armed with clusters of up to 10 pink or white, barbed, sharp spines, 1 1/4" long. Shrubby when young maturing to a tree form, with a woody trunk. 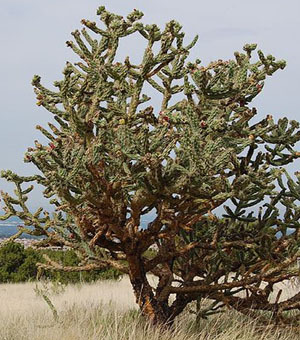 Cholla reproduces when stem joints fall to the ground and take root. Green fruits mature to bright yellow and persist into winter. Use tongs when handling plants.